Cambodia. Democratic Kampuchea. Khmer Rouge. Angkor Wat. For more than 30 years, Cambodia has been remembered as the country with a tragic past, or the country that comes with a UNESCO temple site which exists outside of the remembrance of its Khmer Rouge experience. 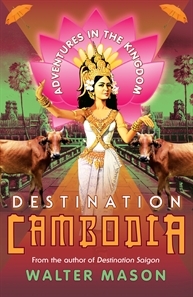 Walter Mason’s Destination Cambodia offers a Cambodia that is different from the Cambodia featured in most travel writing. It is a collection of travel tales and personal reflections gathered from Mason’s multiple trips to the country over the years. Unlike other authors of the genre, Mason chooses to leave the grandeur of Angkor Wat, and the tragic remembrance of the Pol Pot regime out of his musings of a country he has come to call home. He also avoids the snobbish trap of claiming to represent the Cambodians and their cultures and beliefs in this book. Instead, Mason’s Cambodia features the “common people,” who have come to offer Mason and his readers insights into a nation that is straddling its traumatic past and its efforts to embrace the future and the modernity afforded by technology. From the badly scarred university student to the unassuming writer, the homeless street hustler to the temporary ordained monk with an aspiration to marry a beautiful wife, the focus that runs through the tales is on the common people and their everyday experiences, rather than on their memories of the past. The tragic history of the Khmer Rouge does not feature much in Mason’s re-presentation of Cambodia, but it nonetheless, remains very much an unspoken subject in his writing. Mason’s silence regarding this past can be explained by Burcu Münyas as the result of a lack of education regarding the country’s Khmer Rouge past. According to Münyas: “For many youths…the Khmer Rouge [soldiers] are unlikely fictive characters who occupy certain roles in a collection of horror stories they hear [from their parents]” (417). This lack of association with their parents’ recollections of life under the Khmer Rouge regime explains why the youths of Cambodia (such as Mason’s close friends Panit and Kimly) – the generation born after the fall of the Khmer Rouge – appear dislocated from the country’s past. This is despite their insistence that memorial sites such as Toul Seng and Cheoung Ek Killing Fields are places everyone should visit to learn about the evils of the Khmer Rouge. It is this disassociation with the past, and the youths’ desires to move out of the confines of Cambodia (both geographically and figuratively) that allows Mason to explore a Cambodia that is caught between its tragic past and an uninhibited embrace of modernity and progress, even as the individual struggles with the demands of everyday survival. Juxtaposing the Cambodians’ valorization of Khmer history and traditions with what he learnt from David Chandler’s definitive book on Cambodian history, Mason allows us to decide for ourselves what Cambodia could really be. Despite his credentials as a Buddhist writer, Mason does not impose his views regarding the Cambodians’ practice of Buddhism, or the more superstitious manner of attributing magic and grandeur to events they cannot explain, reminding us of Mason’s earlier explanations: “I don’t claim to speak for Cambodians, or understand completely their culture” (xvi). However, there are instances when he exhibits suspicions or cynicism towards the Cambodians’ Khmer-Buddhist perspectives and psyche, and one cannot help but think if some of the cultural meanings of these supposedly superstitious rituals and beliefs have been lost to Mason, and subsequently, to the readers of the book. Mason manages his best to avoid romanticising the Cambodians and their struggle with poverty, but he is quick to see the beauty in his friends and their tenacity to survive the demands of life in a big city. Through his interaction with Cambodians from different walks of life, Mason explores Cambodia’s popular culture and queer sub-culture, and presents his personal musings in a down-to-earth, mostly witty prose. Notably, despite Mason’s various references to the camp-ness of a few of his Cambodian friends, several interactions with transvestites, and his knowledge of an almost invisible gay community, Mason does not paint a queer Cambodia. Once again, Mason avoids fetishizing a queer Cambodia. And by avoiding the “tourism trap,” Mason provides a more reasonable, if not authentic, picture of Phnom Penh with his description of the time spent at small eateries, various temple compounds, and even a gay bar. He re-presents the misadventures and conversations with his Cambodian friends rather realistically without judgement on the locals’ lack of command of English. Nonetheless, one cannot help but wonder if some of the dialogues have been exaggerated as the Cambodian “characters” launch into tirades of melodramatic proportions when defending their national culture, or upon realising the possible inadequacy of their hospitality on occasion. Destination Cambodia does not stop at being a mere recollection of what Mason experienced in his travels and adventures. It also allows him to reflect on his position in a Cambodia which opens its arms to him but remains fiercely guarded over its cultural history. The real destination is not Cambodia, but rather, within Mason’s own reflections of what he has come to learn from his interactions with the unlikely heroes he meet in the country. After all, Christophe Macquet, was right when he reminds scholars of Cambodia history and literature that Cambodia “is not just old stones – it’s people” (May 32). Sharon May. “In the Shadow of Angkor: A Search for Cambodian Literature.” Manoa. Vol 16, No. 1. (Summer 2004). pp27-35. Burcu Münyas. “Genocide in the Minds of Cambodian Youth: Transmitting (hi)stories of Genocide to Second and Third Generations in Cambodia.” Journal of Genocide Research. September 10(3). (2008). pp 413-439. Walter Mason. Destination Cambodia: Adventures in the Kingdom. St Leonards: Allen & Unwin, 2013. Lye Kit Ying is a Phd student in the English Literature at Nanyang Technological University. She is currently working on her dissertation which discusses the representation of political violence in contemporary Southeast Asian literature.